“Storm Boy” is based on a beloved 1963 Australian children’s novella. That story, set in the 1950s, was actually made into a movie in 1976. This version takes the original and wraps it inside a modern tale with similar themes. The combination makes for a moving and memorable film. Geoffrey Rush stars as Michael Kingley, the retired matriarch of one of Australia’s largest land development companies. His son Malcolm has taken over the family business. In the name of progress, the company is looking to drill for oil on some prized, natural land, a plan that has sparked controversy. Madeline, Malcolm’s teenage daughter (Michael’s granddaughter) is one of those against the drilling. She desperately wants the land, home to hundreds of wild pelicans, to remain preserved. This has caused an angry split in the already fractured family. Back home to cast his board of directors vote on the drilling proposal, Michael tells Madeline the story of his youth – growing up on an isolated stretch of land on the coast, with only his father. That is until he finds three baby pelicans whose mother has been killed by hunters. Michael nurtures and raises the birds. And they become his best friends, shaping his life and his destiny. Finn Little and Jai Courtney play young Michael and dad (referred to as “Hideaway Tom”). Their relationship is one of the most genuine elements of “Storm Boy”. Director Shawn Seet, best known for his award-winning work on numerous Australian TV series, provides an appropriately tepid tone. He also nicely balances the parallel stories, which are familiar, yet focused. There isn’t a single scene that feels unnecessary. That’s a rarity for a film these days. For Courtney (“Divergent”, “Suicide Squad”) this is the best role of his career. Little has a very bright future. And Rush never disappoints. The Oscar-winner “shines”, bringing humanity and honor to a somewhat tricky role, avoiding the “wise old man” cliches. 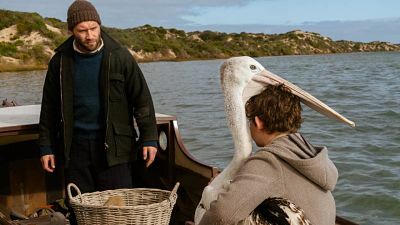 But maybe the most impressive thing about “Storm Boy” are the amazing scenes involving the pelicans. The wild birds are required to act and interact with the cast in a variety of ways. First as babies and then adults, they all hit their marks, delivering incredible performances. Several trainers were used during filming. As a group they deserve a special honor – as does Bruce Young for his brilliant cinematography. The messages of protecting the environment and encouraging the next generation to make a difference in taking care of our planet are timely. Thankfully, they don’t come off as preachy. The screenplay (by Justin Monjo) weaves together the past and present seamlessly. This provides for some on-screen moments that will both stun and challenge audiences. “Storm Boy” belongs with the classics of the child-animal friendship genre: “Free Willy”, “Fly Away Home”, “Old Yeller”, (insert your favorite here). Sadly, for the most part, Hollywood has stopped making these movies. And there’s no chance an American studio would have produced “Storm Boy”, as it avoids most of the box office motivated elements inherent with the category. Seek out “Storm Boy” – and be prepared to be blown away. It’s a visual and emotional triumph. On The Official LCJ Report Card, “Storm Boy” gets an A-.